What Therapists Say and Why They Say It, 2nd ed, is one of the most practical and flexible textbooks available to counseling students. 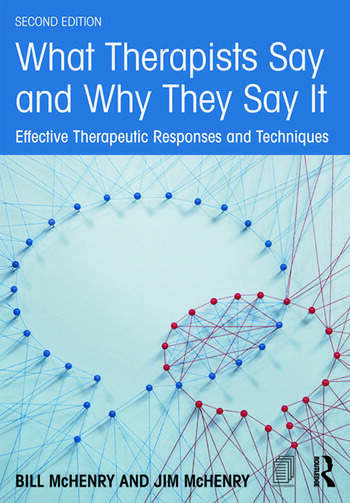 The new edition includes more than one hundred techniques and more than a thousand specific therapeutic responses that elucidate, in the most concrete possible way, not just why but how to practice good therapy. Transcripts show students how to integrate and develop content during sessions, and practice exercises help learners develop, discuss, combine, and customize various approaches to working with clients. The second edition is designed specifically for use as a main textbook, and it includes more detailed explanations of both different counseling modalities and the interaction between techniques and the counseling process—for example, the use of Socratic and circular questions within the art therapy process. What Therapists Say and Why They Say It, 2nd ed, is also designed to help students make clear connections between the skills they learn in prepracticum and practicum with other courses in the curriculum—especially the 8 core CACREP areas. Bill McHenry, PhD, is the dean of graduate studies and research at Texas A&M University-Texarkana. Prior to accepting an administrative position, he served as a counselor educator for 10 years. Jim McHenry, EdD, was a professor at Edinboro University of Pennsylvania for 32 years and is now a semi-retired professor emeritus.